The confluence of the Whitewater River and Walnut River was originally inhabited by Native Americans, primarily the Osage, who found the land ideal for hunting and fishing. So did the settlers crossing into the area via horse and covered wagon from the east. In 1868, C.N. James settled in the area and built a log home to serve as a general store and trading post. He paid $40 for the land title from the U.S. Land Office. He named the new settlement after his wife, Augusta. The original log cabin structure still stands at its original location, right next to the Augusta Historical Museum. The first train rolled into Augusta in 1881, to support the growth of livestock production and increased agriculture throughout the area. Shortly after the turn of the century, two railroad companies served the town, the Santa Fe and the Frisco. The discovery of oil and natural gas in Butler County led to further growth and became a major source of employment for many years in eastern Kansas. The oil industry played a significant economic role in developing Augusta. The closure of Mobil Refinery in 1983 marked a change in Augusta's commerce. The City's downtown is in the process of undergoing a facelift. Storefronts are being improved to invoke historic details and improve the appearance of the buildings. The Streetscape project completed in 2009 added new sidewalks, lighting, landscaping, and other improvements to the red brick streets of the downtown. The downtown also includes two historical sights. The C.N. 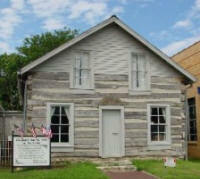 James Log Cabin is located at 303 State Street and is listed on the National Register of Historical Places. The Augusta Historical Theatre is located at 523 State Street and is listed on the National Theatre of Historic Places. 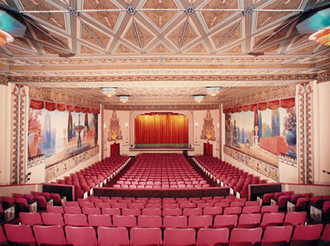 The Art Deco Theatre was built in 1935 and remains a working theatre today.